Every year around the holidays, memories of the times I’ve spent up north at Christmas and New Year’s inevitably surface. I’ve never been much of a New Year’s Eve fan, at least not once I started going out for parties and horn-blowing in various cities. Nothing quite so mind-dimming as kissing and hugging a bunch of strangers when the clock strikes midnight. My thoughts at those sorts of events were instead on Harbor Springs, and memories of my childhood when my whole family was together in the house on Main Street for Christmas break. Friends used to come over with their families—the O’Leary’s, the Rau’s, the Menzi’s—to ring in the New Year. The adults and the kids all crammed into the front room together, where we laughed hysterically while we played charades. There was a particularly persuasive enactment of the title Gidget Goes Hawaiian one year that had my team guessing it in no time. Even back then, when there was no such thing as a personal laptop or cell phone, it felt like a throwback to another era. The nostalgia was further stoked when we would spend one of those holiday evenings at the Menzi’s house. Perched above town on a property that’s like an idyll, the big white house with green trim and a wrap-around porch, all frosted in snow and twinkling lights, would make anyone believe that chestnuts were roasting on the hearth inside. That wasn’t far from reality. We’d all gather there, each room begging you to come in and breathe deeply its home-is-where-the-heart-is magic, and settle in to watch old movies. The laughter that erupted when we were all together permeates my memory, laughter that started with the legendary sense of humor of our fathers and took over our group like the Wave. But what stands out even more clearly is what we ate while we watched movies there in the dark in front of the television. Far better than any chestnuts were the big bowls of caramel corn that were passed around and devoured in minutes. I asked Mrs. Menzi where she got such crisp, salty-sweet popcorn, and she told me she made it herself. That would explain why it was still warm, and why it told me a whole new story about what caramel corn really is—a story that has absolutely nothing to do with Cracker Jack and everything to do with freshness, with butter and brown sugar. I asked her for the recipe, which it turns out has a Harbor Springs history. Carol got the recipe from Patsy Ketterer, who got the recipe from her grandmother, “Nana” Wager. I have thought about the caramel corn more often over the years than I have actually made it. Then recently I was making a move from one home to another and was sorting through my cooking files. Mrs. Menzi’s caramel corn recipe was still there. My note at the bottom of the recipe reads, “From Harbor Springs mid-80s.” Then another note reads, “Made again Thanksgiving 2006 in Lansing.” I set the recipe on the top of the heap so that this year, when I am back in Harbor Springs over the holidays for the first time in a lot of years, I would pull it out and make her caramel corn again. Maybe the scent of it will draw everyone into the room, and who knows, we just might turn off our laptops and phones for a little while to watch old movies or play charades, laughing all the way. This article was published this month in our town newspaper, the Harbor Light, where I’m delighted to be contributing a monthly culinary story and recipe from the kitchen here on Main Street. It’s worth it to buy fresh popcorn if you’re not sure how old yours is. I like Amish yellow popcorn. In a large, deep pan, heat the canola oil and pop 6 quarts of popcorn. Get rid of all unpopped kernels. Spread popcorn on two baking sheets. 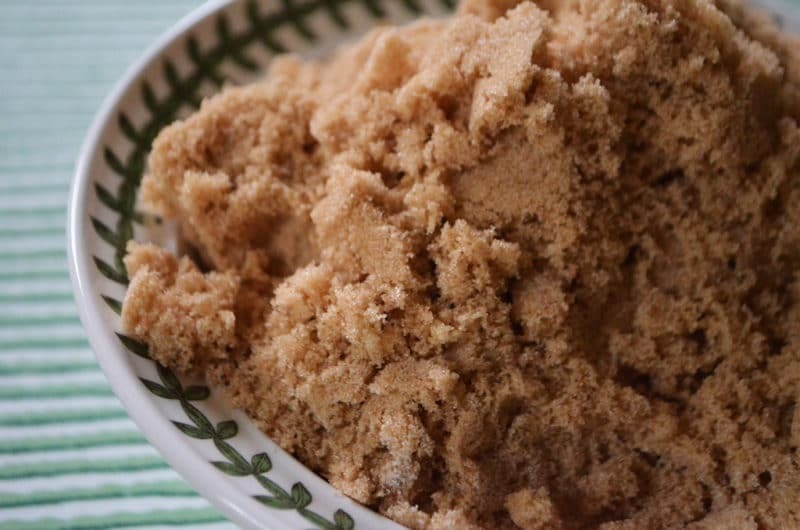 In a medium saucepan, combine the brown sugar, corn syrup, butter, cream of tartar and salt. Bring to a boil over medium-high heat and cook for 5 minutes, stirring constantly. Remove from heat and add the baking soda; the mixture will puff up as the baking soda is stirred into it. Pour the caramel evenly over the popped corn and immediately mix thoroughly with a large metal spoon or plastic spatula. This is more of a folding motion than stirring to coat the popcorn with the caramel. 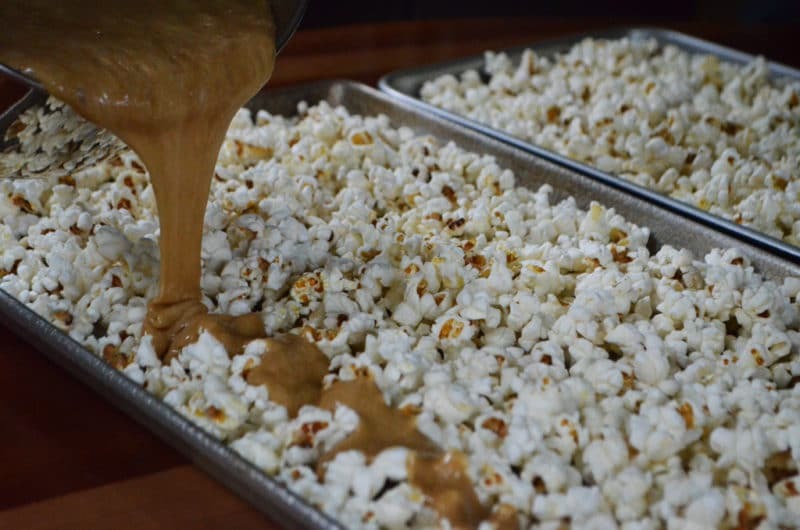 Place both pans in the oven on middle shelves and bake for 1 hour (this is what crisps up the caramel corn), rotating the pans to opposite shelves halfway through the baking time and turning the caramel corn over with a spatula every 20 minutes for even baking. 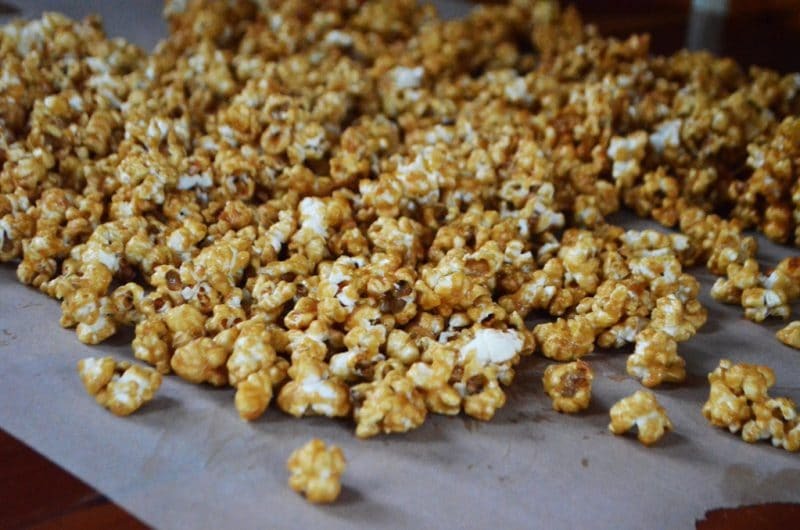 Immediately turn the caramel corn out onto sheets of waxed paper and when cool enough to handle, break into pieces. 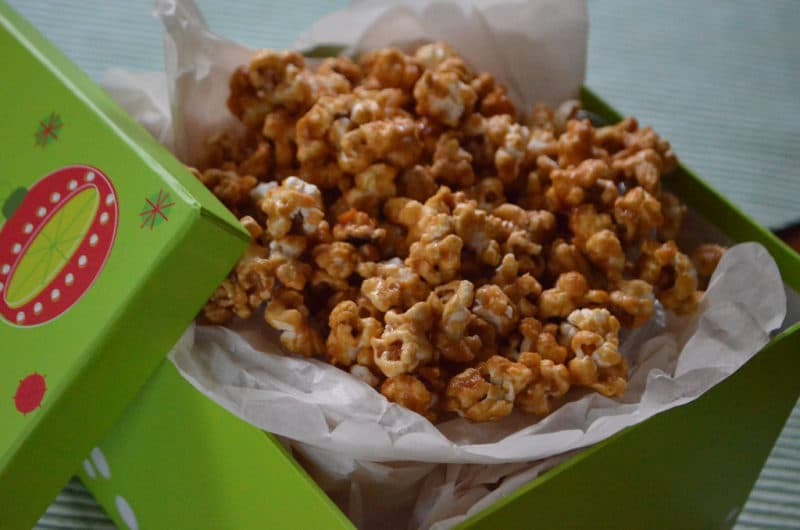 Crunch on the caramel corn right away, and if you can part with some, in lovely container with a ribbon on it, you’ve got a great gift for a friend. 9 Responses to "Caramel Corn to help you ring in the New Year"
Have you tried using flavored baking chips to make other flavors. The hard part is finding different flavors of chips. Cherry are sometimes available but other flavors are hard to find. Have mercy! I have a serious thing for popcorn, caramel in particular. My mother brought two bags of homemade deliciousness to me in the hospital after Abigail was born. It restored my energy and kept me fueled in those first days. Sweet memories. What a great way to fortify oneself after childbirth!!! Mother knows best. Thanks for that, Tara!! I only have a micro-wave carmel corn recipe. I like it a lot, but this looks very interesting. I am going to make this for sure. Thanks….we loose the notion of some of these comfort foods. We really do miss some of those comfort foods, don’t we. I hope you do make it and enjoy. The microwave recipe sounds interesting too!